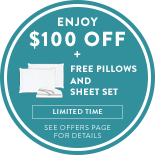 We give you two feels, free shipping, and a 100 night trial. It's no wonder everybody loves us. We want you to get the best sleep of your life. That’s why we give you 100 nights to try our products. If you don’t love it, we’ll refund you—no questions asked.